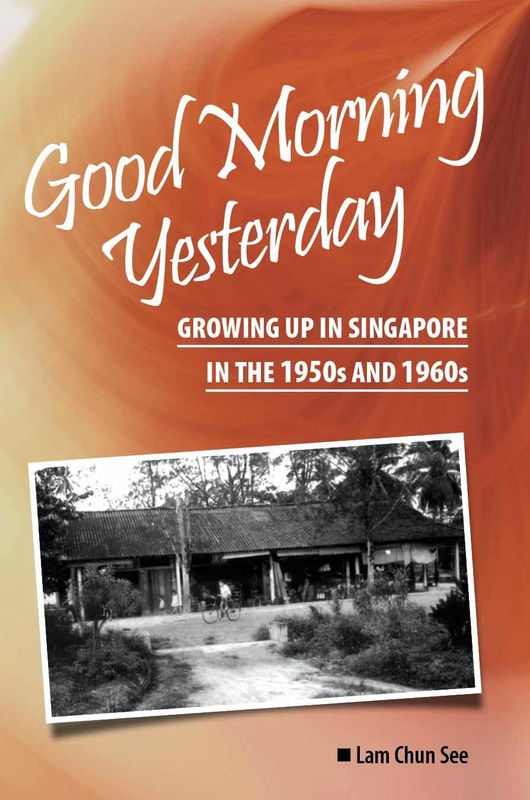 I was approached by historian, Dr Loh Kah Seng, through my brother Chun See, to recall our experience of how our family was affected by the British military withdrawal from Singapore. 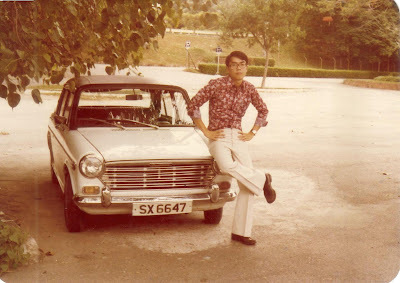 My father worked at the British Naval Base in Sembawang most of his working life. I would like to share with readers what I wrote to Dr Loh via email. But I am afraid you are going to be disappointed if you expect tales of severe hardship and struggles arising from this ‘tragic’ turn of events in our family’s history. The irony was this. There were many retrenched base workers having a hard time, but not for my father - the opposite was true. All these years, right from prewar days to his 'golden handshake', he led a tough life - Japanese occupation, staying in a kampong, looking after a family of 7, while sustaining on a small income. 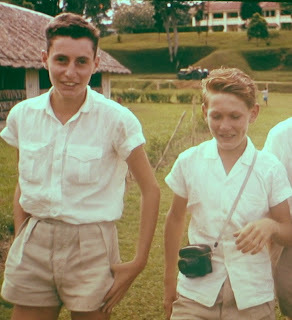 This was especially so when two of my younger brothers were going to the university. But things changed after being retrenched. He received a decent five-figure retrenchment cash benefit which included salaries accrued during the war years. The timing was perfect with all his children coming out to work, the family was in fact very much better off after his retrenchment (or retirement). During those hardship years (before his retirement) in the sixties, I worked in the PSA as an operations staff and my sister was a primary school teacher. In short, we helped to supplement my father’s meagre salary during the lean years. To be fair to my father, I was not good in my studies like my younger brothers, hence had to start working after my 'O' level and this was a natural course of action taken by me (and many of my contemporaries in those days). As for my father’s reaction to the ‘bad news’, he did worry a bit for Singapore when the British decided to leave Singapore, but had a great confidence in the Mr Lee Kuan Yew government to solve Singapore problems. However, he did criticize the government for acting tough to the British at first, and later on pleading with them to delay leaving Singapore. The retrenchment benefits were given quite fast to him - a matter of months. He was not asked for retraining to other jobs. Upon retirement (or after being retrenched), he worked a year or two in his friend’s accounting firm and later on left to work in a timber firm for a couple of years and fully retired at the age of 60. Since he worked in private companies he was unaware of matters pertaining to other retrenchment workers. As far as I know, he was not offered to migrate to UK. Anyway he was deeply rooted to Singapore. My impressions of KL landmarks were developed over a period of time and came about as a result of a) Planned holidays, b) University of Singapore versus University of Malaya at sports, and c) Business. When I became knowledgeable about KL, I found many “Lampor Yan” can be from different dialectical groups but the preference is to communicate in Cantonese. For me there were two memorable events that came as a result of a planned holiday; one took place in the mid-60s and the other in the early 70s. I start off with the early 70s event. Just before my NS enlistment, my best friend “Fei Lo” Weng (buddies since Secondary Two) had to go to sea. Fei Lo completed his radio marine diploma course at the Singapore Polytechnic and like many others who took up flying or went sailing it was one way to financially support a family whilst conveniently to avoid NS. 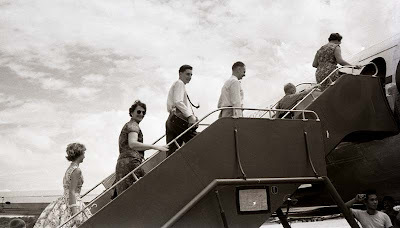 You see after Secondary Four, those who joined Singapore Airlines (SIA) – as commercial pilots and flight engineers, and Neptune Orient Line (NOL) – as marine officers – need not serve NS. This was highly unusual as most of us think of NS deferment for tertiary studies or part-time NS - in the Vigilante Corp or Special Constabulary. Fei Lo knew that by working for NOL he was going to be away from home for 6 months to a year; in fact on the very first trip he went away for almost 5 years until we met again when I was in the university. During this period we kept in touch through snail-mail. Often when he returned to Singapore, he was on “stand-by”; ready to board another vessel in Singapore waters or fly to Nigeria to board a new vessel. He finally called it “quits” when he turned 33. Thus this trip to KL together was one way to spend our remaining days together. Photo 1: Fei Lo, Aunty Ingrid and I in the Lake Garden (circa 1972). I took this hair-cut hoping that I could clear through NS Enlistment day but unfortunately failed to pass the actual test and ended up “4 X 2”. We took more photos at the National War Monument and an oval-shaped building in the Lake Garden. 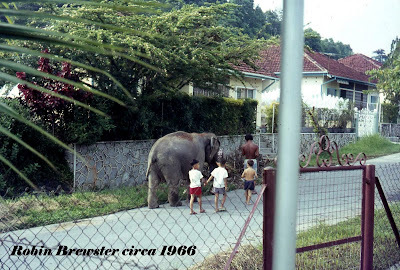 We arrived in KL by train and our accommodation was at his maternal grandmother’s house in Salak South Gardens, a fairly new residential estate in the early 1970s. Nearby was the Salak South railway bridge. Salak South Garden had rows of terraced houses on a hill-slope. I tasted the best sui kow and char siew fan from a kopitiam in that estate; “Lampor Yan” friends tell me it’s still the best in the KL area even now. Sui kow was for breakfast, the other being yow chay kwai with “Pai Kuak Tong”. I was very impressed with the size of the sui kow because in Singapore I could only find small wantons. Malaysian kopitiams were unusual from those in Singapore; the suburban kopitiams had at the most two stalls and a drinks operator. Most times one stall stayed open. I learnt something about Malaysian morning breakfast habits; Nasi Champur for Malays, Roti Prata for Indians and noodles for Chinese. Singaporeans will definitely have a hard time adjusting to Malaysian breakfast habits because bread is not often served at kopitiams. Aunty Ingrid and her boyfriend drove us to many places, Port Dickson (nearest place to swim in the sea), Port Swettenham, Lake Gardens, Kajang (for satay) and Genting Highlands. That was the first time we stepped into a casino but it really was not a pleasant sight. I saw squatting women in tears, women who went to this little small window to pawn their jewellery for cash, and men who aimlessly paced up and down the corridor outside the casino. Fei Lo and I went out on our own on some days. We visited the Merdeka Stadium and Fitzpatrick Supermarket at Weld Road. We even had time to pop into Bukit Nanas Convent to see my friend. Little did we know that among my friend’s friends, one pretty Malay student was later destined to be an UMNO politician/Minister. On one visit to Petaling Street, Chinatown we shopped for “Kat Chye”. Photo 2: Left; Father’s letter to us (circa 1964). Right; PAP election headquarters at Batu Road. Batu Road reminded me so much of South Bridge Road in Singapore with all the typical advertising signboards and Chinese inscriptions on pillars (circa 1964). 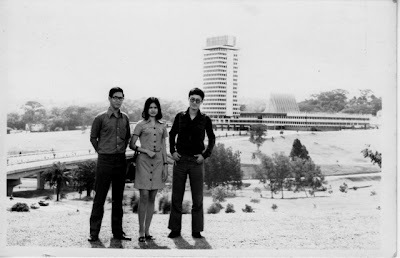 By September 1965, when the party was de-registered, there were 1,700 party cadres in Malaysia. In 1964, I received my father’s telephone call from KL. As the trunk telephone link between KL and Singapore suffered “noise disturbance”, I heard him telling me he welcomed me to join him for a short holiday. My father was in KL because the PAP contested the Malaysian General Elections. So my mother sent me off at the Tanjung Pagar Railway Station for the train ride into KL and I had with me Malayan Dollar $20. It was a very enjoyable trip for this little young boy because his primary school textbook, “Malayan Geography Series” came “alive” about rubber trees, people at work, and valleys and hills. Interestingly I found many train employees were Indians and Sikhs, holding positions like train drivers, ticket inspectors and maintenance crew. I arrived at the KL Railway Station and walked along a road leading to the Padang and the Royal Selangor Club. After taking road directions from some adults, I came to a mosque at the confluence of two rivers; Sungei Gombak and Sungei Klang. This part of town was highly unusual; many buildings look like they came out of the story book, “Aladdin and His Magic Lamp”. I never had seen so many buildings with Middle East architecture. Even in Singapore the slight exception was “The Arcade” in Collyer Quay. Photo 4: Left; Klang River and Gombak River meet here and history tells us that this was the original spot where Kapitan China Yap Ah Loy founded KL (circa 1974). Right; Mountbatten Road (circa 1970). Some KL street names could also be found in Singapore such as High Street, Cecil Street and Cross Street. When I met up with my father at Batu Road, I was not sure how to judge his facial expressions. I learnt a few things about politics; the bull symbol was for the Socialist Front, the boat stood for the Alliance Party, and “Sip Sip Ling” was PAP. As everybody was busy with the elections, there was a “Lee Suk Suk” who took care of me for the rest of my stay including making sure I boarded the Malayan Airways flight from the old KL Airport in Sungei Besi to Singapore. We went to see a Malay “silat” movie at the Odeon Cinema. Then off to Bukit Bintang for street-makan and playing the swings, merry-go-round and slides in BB Park (now Sungei Wang Plaza). Many years later I realised “Lee Suk Suk” was the DAP MP for Bukit Bintang. No wonder he knew Bukit Bintang so well at his finger-tip. Maybe “Lee Suk Suk” knew besides baby kissing, there was also baby-sitting. Photo 5: Left; View of KL from Menara KL. Right; Tengku Abdul Rahman rode on this convertible on his way to the Merdeka Stadium to proclaim Malaya’s independence in 1957. KL has changed so much that I can hardly “connect” with her. It’s too urban. Even up on Menara KL, I cannot make out the landmarks because the “old” is gone. However I did have a bit of luck. I spotted the first Malayan Prime Minister’s car which was used during the 1957 Independence Day ceremony. Like the humble coin phone, phone cards are fast becoming extinct in Singapore. I think the first time I used a phone card was in 1985 when I was in Japan. Along with a group of colleagues from the National Productivity Board, I had been sent to Japan for three-and-a-half months of training. It was called the PDP (Productivity Development Project) Fellowship Programme and we were housed at the newly completed Tokyo International Centre. We bought phone cards with which to call home. I remember the difficult time we had using the two public phones in the centre. To save on the cost of our trunk calls, we used to make our calls after 11 pm at night which would be midnight Singapore time. And there would usually be a long queue of other residents who wanted to use the public phones. Sometimes I just gave up and paid the extra cost of calling from my room. Most times I just write. No emails or Skype in those days. It was an interesting stay in Japan, but I think I shall blog about it to another time. This is a photo my room at the Tokyo International Centre in Nishihara. Notice the phone on my table? I wonder if my ever sharp-eyed friend Victor noticed something else interesting thing in this photo? My …. how much the world has changed since then. Earlier this year my daughter was in Sweden for 6 months on an exchange programme. Most nights we would chat online for free. One Sunday night, we even had family worship ‘together’; singing hymns and taking turns to read verses from the bible. She even created a blog to share her stories and photos. The other times when I used the phone card a lot was when I was traveling in Malaysia. In the early 90’s, I used to travel to Kuching and Bintulu quite frequently for my training and consultancy assignments. I also had clients in Peninsula Malaysia and that brought me to various towns like Malacca, Kirteh, Kuantan, Port Dickson and even Ipoh. But the one I hated most was Kuala Lumpur because of their notorious traffic. Using the public phones in Malaysia was quite a hassle because they had two telephone companies - Uniphone and Telekom Malaysia. Uniphone was popular in Sarawak and you can recognize them by the yellow colour booths. However, over in Peninsula, it was very difficult to find these yellow booths. Instead, you see the blue colour Telekom Malaysia booths everywhere. Hence I had to keep two different phone cards. And I still have one of them with me today. The other day, I was at a mamak shop located at the void deck of an HDB flat in Toa Payoh when I caught sight of this pathetic looking coin phone. It was dirty and looked like it had not been used for ages. I took the opportunity to try out my new Sony-Ericcson Cybershot C903. By the way, would believe I paid only $1 for this 5 mega-pixel beauty? Of course I had to renew my mobile plan with Starhub for another two years, but then my plan was the cheapest they had, costing only $20 per month. Although it may not be as ‘cool’ as some of the latest touch-screen models or the famous iPhone (I just cannot understand why anyone would queue overnight just to be the first in Singapore to own one), it has everything I need; namely a decent camera that I can used to take pictures of Singapore’s fast-vanishing landscapes for my blog. I cannot recall the last time I used a coin phone; but I can remember when I first used one. 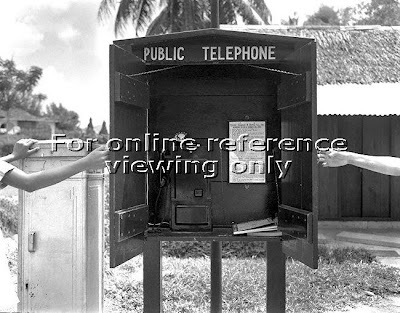 It was the first (and only) public phone that was installed in our kampong just across the road from our house. Like the one in this photo below (picture from the collection of the National Archives), it was housed in a wooden cabinet which had two doors which opened outwards. The cabinet rested on a single concrete stump and base. Chained to the cabinet was a phone book. The year must have been around 1961. This public telephone was just in front of our neighbour, Chiew Soh’s house. Hence their family became the village telephone operators. I remember one time when we received a call from my dad. Both my younger brother James and I wanted to speak into the phone and were fighting over the receiver when suddenly we heard a stern voice from behind us. It was the technician from the telephone company. He thought we were playing the fool with it, and snatched the receiver from us and hung it back on the hook. Can you remember how much it cost in those days to make a call? I think it was 10 cents for three minutes. Anyway, we had a cousin from Johor Bahru who knew of an ingenious way to avoid putting money into the phone. Instead of dialing the number on the circular dial, you tap the phone’s receiver hook a certain number of times in quick succession. For example if the number was 4, you did that 4 times, pause briefly and then repeat the process for the next number. I remember he demonstrated that to us when we were in JB one time. I wonder if any engineers out there can confirm if this was possible. Over the years the public phone has evolved considerably. Below are some photos that I have taken recently, including one from Malaysia. This one is from my friend Peh’s house. Although it looked pretty cute, he hated it because it was so troublesome to dial the numbers. Next time, I will blog about my experience with phone cards. Yesterday I received an email from a historian, Dr Loh Kah Seng who is looking for participants for his book project on the British bases and military withdrawal from Singapore. Below is his open letter published at his blog. If you would like to offer your assistance in this worthwhile project, please visit his blog. Thank you. f you remember the British bases and rundown, or have a family member, relative or friend who does, kindly contact me to lend your voice to an important episode of our national story. Can you identify the old beauty in this photo? 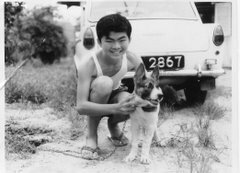 Eh …… I am not referring to the two-legged one, though I must say that my old friend Peh Seng Ket looked rather dashing. I am also very curious about this place. It looks terribly familiar but unfortunately my friend Peh cannot remember where this photo was taken. My very first trip outside Singapore was to JB to watch a Mandarin movie, “Sun, Moon & Star”. That was in 1961. “Sun, Moon & Star” as far as I know was never screen in Singapore and we had to drive to the Cathay-JB Cinema. There was a very prominent Cathay logo neon signboard on top of the building visible from Woodlands in Singapore. Photo 1: “Sun, Moon & Star” (part 2). Who is the one with the crutch? My parents must have been very loyal fans of Grace Chang; like many others who knew her from the days of the “Mambo Girl”. Apart from the inconvenience of crossing over the causeway and the stringent official custom checks, there was no need for international passports. You produced your Singapore ID to the Malayan immigration officials. For me, I didn’t even need to produce my birth certificate. I was never a fan of Chinese black & white movies unless they were Cantonese action movies like “Wong Fei Hung” or slapstick comedies starring “Nga Chat Soh”. To give you an idea on the length of “Sun, Moon & Star”, it was screened over two sessions; Part 1 this week and Part 2 two weeks later. Cinema-goers had to retain one portion of the ticket as proof for viewing the other part. Within each part, there was even an intermission. I remembered Part 1 was all about “a boy falling in love with girl(s)” but it had too much dialogue. Poor me I was looking for the English subtitles at the bottom of the screen but they were colored yellow and being seated somewhere at the Back Stall, this was a real eye strain. I was very restless throughout the movie and my father had to raise his voice to shut me up. Finally he asked me to wait outside the cinema. This was a great opportunity for me to explore the streets outside Cathay-JB. I think there was a Hotel Malaya at one end of the street and itinerant pushcart hawkers selling drinks, kachang-puteh and kueh-kueh outside the cinema. Part 2 was action drama because it showed the fighting between Chinese and Japanese soldiers but the war drama was hardly the sort I was looking forward to like in “The Guns of Navarone”. The action began with the blowing of the bugle, the waving of flags (sounds Communist alright), artillery shells flying and the charge of the human wave towards the enemy position. For some strange reasons, the camera never focused on the Japanese soldiers but most of the time on the beautiful Grace Chang and Julie Yeh. After many decades, the only question I would have loved to ask; who was the person walking with a crutch in that movie? For many people, JB might be a quiet place. Not for me. Photo 2: Left; On the causeway and in the distance is Lumba Kuda flats in JB with its prominent water-tank on the roof top (circa 1967). Right; Cathay-JB Cinema next to the Lumba Kuda flats (circa 1964). For example after that Mandarin movie, my family headed to the second-best place for satay; after the Beach Road Satay Club in Singapore. The satay stalls were located next to a public toilet facing the JB bus terminus for Green Bus, Alec Bus Company and South Johore Bus. Sampling JB satay and mee rebus was a common occurrence for me because my father loved country-side driving and sometimes drove to view the newly-built residential estates, one of which was Marine Vista in the Jalan Straits View vicinity. The old customs house just after the Malaysian immigration checkpoint was a prominent landmark for me. It was here we thumb-up for free lorry rides to Kuala Lumpur and Penang after we completed our Secondary 4 exams. We knew that the Malaysian-registered lorries had to clear the Johore customs after their delivery trips to Singapore. 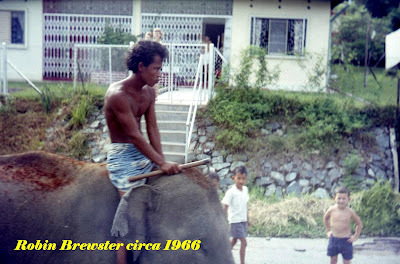 Getting that ride was never easy and on most occasions we had to wait for hours. It was not because the drivers turned us down. Rather we had to check with each lorry driver on his ultimate destination. We were not looking for lorries stopping at Yong Peng or Segamat; we were on the look-out for lorries going to towns nearer to Kuala Lumpur such as Seremban or Cameron Highlands. Coming back to Singapore from up-country, we hitch hiked the Straits Times early morning delivery truck from Jalan Tiong, Kuala Lumpur to JB. Even up to the late 1980s, I found that the New Straits Times daily newspaper was only printed in Kuala Lumpur and distributed to the other Malaysian towns. Thus, a JB New Straits Times reader could only get his newsstand copy by mid-day. Photo 3: Left; JB Bus Terminus (now City Square). In the background is Jalan Wong Ah Fook. The row of two-storey buildings still stand – it’s called Central Building. (Photo courtesy of Fred York. circa 1956) Right; The old customs house on Persiaran Tun Sri Lanang. This part has been cleared to make way for the second Malaysian Immigration and Customs building. 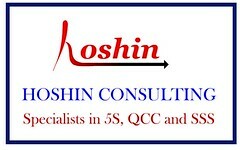 Bukit Chagar CIQ is the third development. You can see Woodlands in the background. Before Taman Sentosa became popular with Singaporeans, we patronized the cinemas such as REX along Jalan Wong Ah Fook and the Capitol Cinema at Jalan Stesen. The JB cinemas screened X-rated movies like the “Carry On” Series which were terribly censored in Singapore. You could never understand the story how come an about-to-be naked woman screamed one moment and then a smiling Sidney James chuckled. At other times when we saved enough pocket-money, we went to the Seaview Hotel to watch those forbidden floor shows. No they didn’t have those wrestling with python shows. It was more like “Bend it like Beckham”. From a bus-stop on Jalan Wong Ah Fook opposite the JB Bus Terminus, we took the local Alec Bus Company to far-away places like Jason Bay and the Kota Tinggi Waterfalls. No part of Johore was too far for us. Each time we came up to JB, we learnt more of the street names and the buildings. We didn’t come up for window-shopping. Very soon S$1 no longer had the same value or interchangeably as M$1; perhaps telling us that we were no longer school-boys. Photo 4: Approximate location of the old Cathay-JB Cinema on Bukit Chagar. Jalan Lumba Kuda was the road in front of the cinema but it is now outside the CIQ security fence. Today JB is no longer a sleepy town but like Singapore; many of the historical landmarks have made way for economic development. So it has become a bit of challenge for me now to try to find the former Cathay-JB Cinema, REX Cinema, the old customs house, Chung Kiaw Bank building, Seaview Hotel, the unique-looking star-fish flats next to Cathay-JB and even the former JB Bus Terminus. I found that Cathay-JB is now a part of the Buki Chagar CIQ facility. To find its exact location look out for the three blocks of flats in Photo 2. The buildings are still standing. Rex Cinema is a private carpark opposite KOMTAR. Chung Kiaw Bank building is now UOB building, next to the first flyover after your cross the causeway in the direction of Buki Chagar CIQ. Good Morning Yesterday has brought together people across great distances and also across many years. Some time ago GMY published my blog about plane spotting in the 1960s and recently an old friend from 47 years ago, David Taylor, saw himself in one of the blog photos and added a comment. David (who I misnamed Malcolm on the blog) and I have not been in touch for nearly five decades but I am now looking forward to chatting to him and perhaps meeting sometime soon. David immediately sent me a rather poignant photograph which I had no idea existed and which my brother, sister and I are absolutely delighted to see. It is from August 1962 and shows the Mitchell family, my younger brother Ian, my father John, myself, my mother Emily and my sister Carol. We are boarding a Comet 2 at RAF Changi to return to the UK – this is our final moment in Singapore after living there for two and a half years. So GMY has enabled my family to see this photograph and I have the opportunity to renew a friendship from long ago. David has other photographs and I may be able to share some of these with you in the future. Perhaps David can be persuaded to blog as well? But I want to tell you about that flight home from Singapore because it was rather extraordinary – the Comet flew only by day and it took us three days to reach the UK. 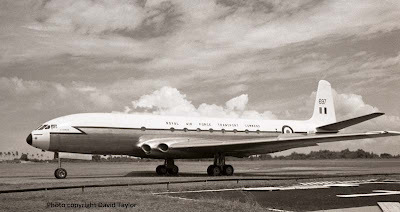 This was also the last passenger flight on this route by a Comet 2 – we were told that as we boarded that ramp our footsteps were being recorded for a film record of the flight (which I have never seen). We left Changi in the afternoon, flew over Sumatra and as evening fell reached a tiny atoll called Gan in the middle of the Indian Ocean. I can still see the intense blue green sea and white beaches of Gan and my brother remembers walking on the beach with my father. I recall very little of Gan except that we spent the night in wooden huts and that there was raucous singing and shouting outside the women’s accommodation by airmen as a very attractive young lady was on board our flight! The next morning we set off across the Indian Ocean and reached Aden in the Middle East for a refuelling stop. There was civil unrest in Aden and (perhaps I am imagining this) but I recall hearing gunfire as we left the plane. In the afternoon we set off across the African continent. This was a journey I saw little of – for some reason there was a shortage of seats and I was volunteered to travel this leg with the baggage! No - not in the hold underneath the passenger compartment – most of the baggage in the Comet was held in rope cages immediately behind the flight deck. I made myself as comfortable as I could on the bags just behind the navigator’s seat! For a while it was interesting to watch the flight crew but I eventually settled down with my book – a bank heist thriller called ‘The League of Gentlemen’. I recall leaving the baggage area just once – to look down from a cabin window as we crossed the River Nile. By late afternoon we reached Libya, this was in the pre Gaddafi days and the RAF had an airbase in the desert about 20 miles south of Tripoli. It was a desolate spot. Both my brother and I recall swimming in a pool, surrounded by a high wall to stop it filling with sand. I also walked to the main entrance looking down an endless straight road leading eventually to the sea and at the enormous dunes piled up around the base. So a second nights rest on our journey from Singapore – this time in the North African desert. On the third day we flew north across Europe, as we did so we lost the sunshine we had become so used to as a thick bank of cloud covered Northern France and England. We landed at RAF Lyneham in south west England on a damp, dull and cold day – it was the English summer! None of our family had any warm clothing and I remember that we gathered in the only warm place we could find, a clothes drying area with hot water pipes! So we were finally home after our three day journey – was I glad? Not at all, I wanted only to return immediately to Singapore!